Relive favorite moments from the happiest, most sparkly and colorful TV series around with the LEGO Unikitty 41451 Unikitty Cloud Car, featuring a spinning propeller and 2 stud shooters to spread sparkle matter studs wherever you go. 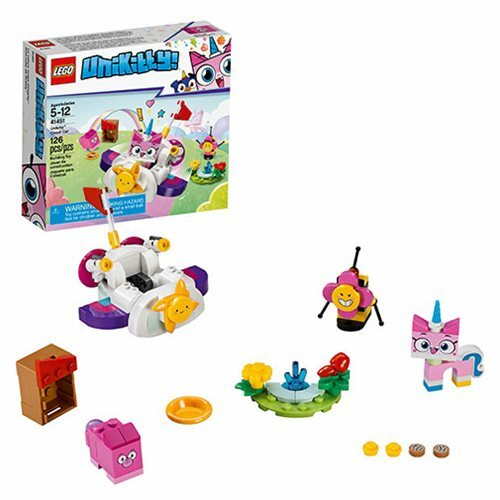 There's also a small park scene and Square Bear's house to build, where Unikitty can meet her friends Feebee and Square Bear for even more crazy fun! Includes 3 buildable figures. The LEGO Unikitty 41451 Unikitty Cloud Car includes 126 pieces. Ages 5-12.